Earlier this year, I had the opportunity to spend some time with family in Manitoba. It was great to have a chunk of time to spend with them. That has happened few and far between since I moved out west almost half a lifetime ago. Unfortunately due to Armando’s new job that he had just started, he was only able to spend a weekend in Manitoba so we had gone a few weeks without seeing each other. So at the end of my family visit, I hopped on a plane and met my hubby in Toronto where he was going to be working for a few days. 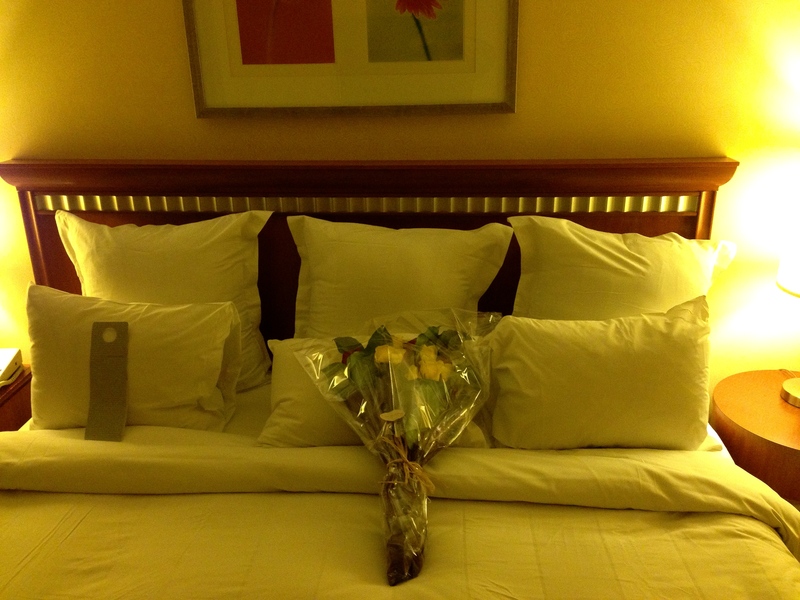 Armando surprised me with flowers when we arrived at the Renaissance Hotel in downtown Toronto. 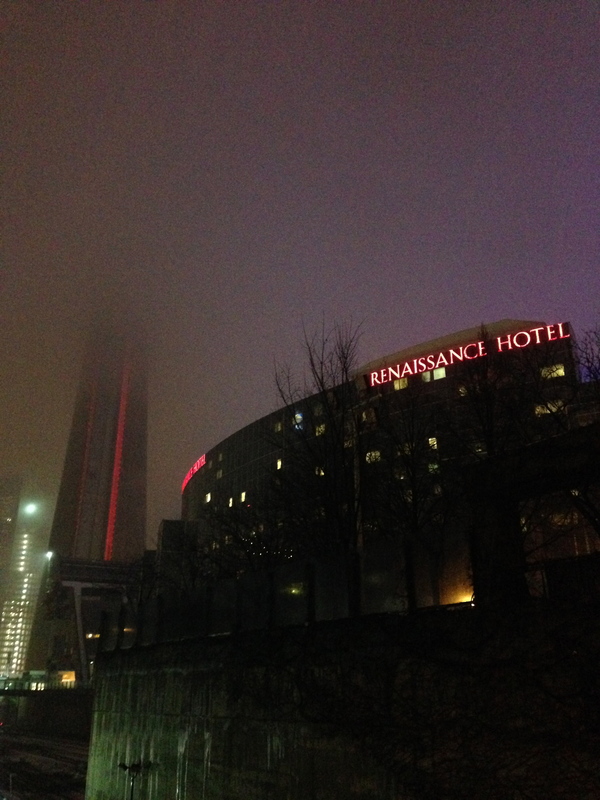 The Renaissance Hotel was the perfect location in downtown Toronto for me to explore the city while Armando was working. The hotel is actually attached to Rogers Centre (SkyDome for us old-schoolers), next to the CN Tower. As you can see, the weather was not perfect while I was there. I normally love exploring a city, wandering from street to street but a few days before arriving I knew the weather was not going to be cooperating so I did some research of what to do during the day while Armando was working. I searched and searched and realized that there were no events or touristy attractions that I haven’t done already that I wanted to do there. Then what? Shopping? I’m not a big shopper. Spa? A luxury I don’t often indulge in. Be an audience member for a TV show? Hmmm, tell me more. Free tickets to see George Stroumboulopoulos? I’m in! I started doing research of all the TV shows that are taped in Toronto. I sent off emails, requesting tickets to the shows but prepared myself to not get lucky. After all, they advertise to request tickets early and here I was requesting them less than a week before I was going to be there. But I sent emails off for tickets to George, The Marilyn Denis Show and Steven and Chris. Maybe one would bite. To my surprise, within a day I had tickets to all three shows! Monday through Wednesday, a show a day. Perfect! 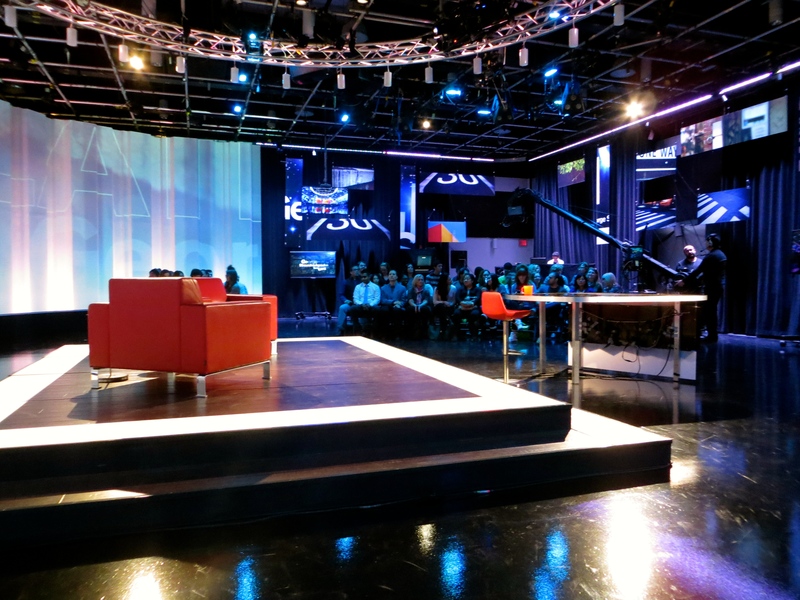 I was going to see my no-so-secret crush, George Stroumboulopoulos at the CBC Studio, or as I like to call him, my Georgie (insert Armando rolling his eyes here). This was going to be my first ever experience of being at a taping of a TV show. We had to sign in, fill out a questionnaire and then they lined us up to take us in groups up the elevator to Studio 43. 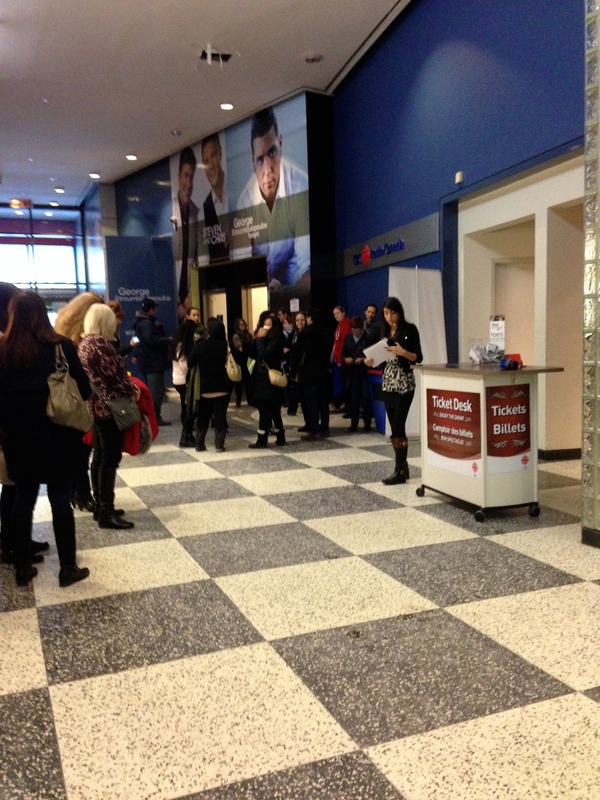 Ticket Desk at CBC Studio where you check in. 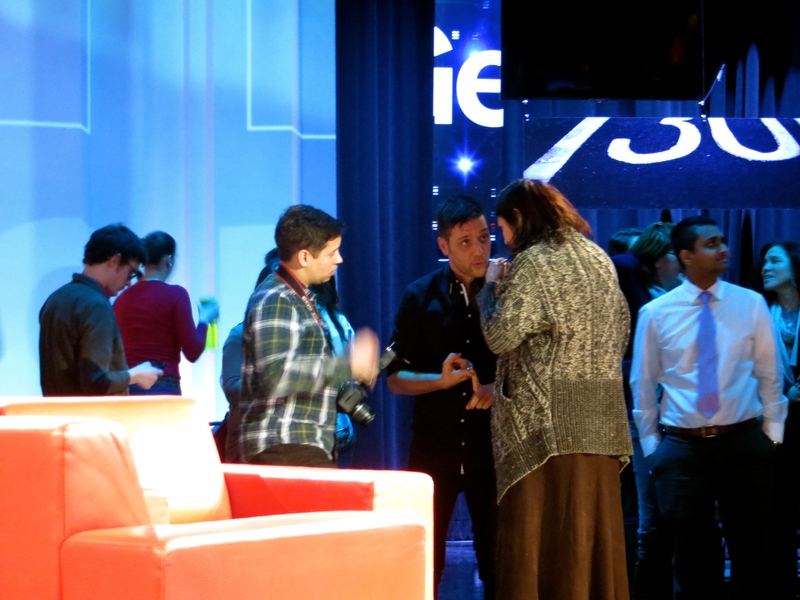 The famous red chairs at Studio 43 for the George Stroumboulopoulos show. The guest for that night was Robyn Doolittle, the author of Crazy Town: The Rob Ford Story. Unfortunately, Philip Seymour Hoffman had died the day before so George ended up taping two episodes that day, the first being a tribute to Philip Seymour Hoffman and then the regular scheduled episode with Robyn. I got to see the taping of both, plus he did some pre-taping of introducing Jake Gyllenhaal as he was going to be interviewing him at a later date. George discussing things with his people between takes. He was much shorter and tinier that I thought he would be. TV must add inches to people because I also remember seeing Charlie Sheen years ago and couldn’t believe how short he was in real life. Anyways, George did not disappoint. I was intrigued and entertained with his interviewing persona and skills, as always. He is a great interviewer. And it was fun to get a behind-the-scenes look of how a TV show is filmed. Here’s a clip of the episode with Robyn Doolittle. It’s hard to see me but I’m in the front row. Day One of my TV Audience Member Tour was done. Tomorrow, watch out as I head to the Marilyn Denis Show!